This is a tad (meaning very) late in what I needed to/wanted to review on this blog, and whilst I do eventually give up on reviewing certain things after a certain amount of time, this is one of the things that I really wanted to review no matter what, even if it meant waiting a long time to get to it. Luckily the Holidays mean more time, and whilst I am meant to be continuing my Requests (Oh boy...) I do want to get this one done before I continue where I left off with NyNy's requests. Wakuteka Take a chance (on me) is the single that I have pretty much been dying to talk about. 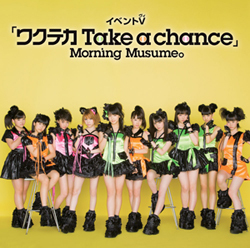 For me, this is the best single by Morning Musume for 2012. It exceeded my expectations, and did everything that One Two Three failed to do for me. It sounded good, it's extremely catchy and creative and, let's be honest, the B-sides are pretty much to die for. Ever since its release I have been listening to every song, and I can not fault any of them at all... well, that's a lie, because I can fault one of the songs, but I digress! Whilst I did love almost every single sans One Two Three from Morning Musume this year, Wakuteka really takes the cake for my favourite Morning Musume single of 2012. I think that it did everything right for a picky/spoiled listener like myself and it brought in a mix of sounds that I really liked. It was surprising actually, what this single had to offer, but I absolutely love it. That all said and done, let's take a look at the songs and what they have to offer, shall we? Wakuteka Take a chance is basically a catchier, better version of One Two Three, or at least in my opinion, and shows a lot more diversity than what One Two Three did. Yes, it's still heavily dominated by The Squirrel and The Shrieking Child, but it has better line distribution that the previous single did, and the vocals don't actually sound too bad with Riho here (surprisingly enough), but that's possibly because the song is actually lower than One Two Three and matches her voice a lot more, making her a bit easier to listen to. I would like to note though that she still has a problem with sounding like a whiny child here, especially on her Chaaaaaaaaaaaaaaaaaaaaance lines. However I really can't fault the distribution here, especially when it comes to the group lines. Other than being catchy as hell and a really fun song to listen to, I love the sound of this song. It has an electro feel, and whilst One Two Three destroyed what little opinion I did have towards electro music, I think that Wakuteka used that electro sound well and showed a more professional, less horrifying take on the sound they were trying to create. The sound of the song is also pretty original and new for Morning Musume, and doesn't fall into the generic Idol category or sound like One Two Three at all (thank Lord Gaki). It's pleasant, and it works well with the current Morning Musume. That, and I really dig the group lines and Sayumi's solo's - that girl really works in the song, same with Fukumura! So other than how whiny Riho sounds, this is an amazing song and one of my favourite A-sides of the year from Hello! Project. It's a cool song, catchy as hell and basically all around very good. I love generic songs, you know that, right? Well Love Innovation pretty much falls into that category, though it isn't overly generic like another B-side from this very single, but it does hit the barrier. When I listen to this song, I actually can't help but think that it sounds really romantic and friendly, as if it's sung by friends who have the same feelings for a boy in their class. It just has this general feeling of happiness and love in it that reminds me of that setting, and I actually would have loved to have seen a PV concept for this song following that theme. But alas, it is nothing but a B-side, and Morning Musume don't have PV's for their B-sides like AKB48 do, which is actually a big shame. It would have been cool to see a video here, as I will continuously express even after I have written this review. I would also like to note that Love Innovation is an extremely refreshing sound to hear for a B-side song. It's actually the most original B-side for a long time, in my opinion, with the last original sounding song being Tomo. Every other B-side so far from this group has either sounded like Aisaresugiru Koto wa Nai yo or Yamette yo! Sindbad, and whilst I do love the latter of the songs, it can get tiring when you continuously recognise the same tune over and over again, so hearing Love Innovation is actually very pleasant, and right now it's also extremely fitting of the current Morning Musume. It suits everyone pretty much. I think that the real downfall with Love Innovation though is the line distribution. Even for a B-side it's pretty terrible, but it does show who the future favourites are here. The only girls who actually get solo lines are Reina, Riho, Sayumi, Masaki, Haruna, Ayumi and Erina, and whilst two of my favourite girls and one of my favourite voices is in there, you're going to have to admit that only Reina and Masaki can sing here, or even just Reina. The rest of them can't, and whilst some will say that the rest of the B-sides can justify some girls not getting lines, I do disagree, but more on that later, really. I just think that for the main B-side, Love Innovation had some bad line distribution, and that's only because I am used to seeing all the members get a decent amount of lines outside of the Reina-Riho hierarchy. Other than that, I think that Love Innovation is a really cute, fun song. It's my favourite B-side of the year, too, mostly because it sounds different and quite original when put next to copy-cat songs like Kanashiki Koi no Melody or Watashi ga Ite Kimi ga Iru. It has a more distinctive sound, and as I did mention, it sounds like a bunch of girls singing their feelings for the boy that they all like. I have no idea what the lyrics are about, though. I want to say this now and embed it into your brains forever more, so read and read well: I LOVE THIS SONG! My GOD this has to be the single most perfect song on this entire single from any of the sub-groups. It's new, exotic in sound, it has flare, maturity, it suits everyone perfectly and infuses the three best voices in Morning Musume together and creates absolute PERFECTION! But honestly, this song is amazing. I was originally a little aware of it, wondering how it would sound and if the song would be Reina-dominated. Surprisingly I fell pretty hard for this song, and it is undeniably one of my favourite songs from Hello! Project this year. It really shows great diversity in the three voices, but the song suits them all, and that was the most surprising thing of all, because the song is pretty mature and it includes Masaki, who has such a damn cutesy voice. Again, this song shows great diversity in each of their voices. Reina has undeniable maturity here, and she sounds so refreshing with a lower tone. Haruka's voice shines so much here too, her huskiness is definitely noticeable and she sounds really wonderful, and whilst Masaki does sound very cute, she brings a balance to the group and sounds great! The sound is totally different to the other songs on this single, and it stands out a lot more than the other two B-sides. It has a unique, exotic sound which I have never heard from Morning Musume before, and the formation of members is different and new, but they all blend and work together so beautifully. It's a truly great song, one which has a lot of maturity, flare and attitude. I really have no issue with this song, other than it sounds a bit too risqué for two elementary/middle schoolers to be singing, but whatever. I love it, and I won't stop loving it, either. Too bad Reina's leaving, because no one will match this amazing blend of voices once she's gone. Go figure. Remember that I mentioned a song that's more generic than Love Innovation? Well here it is! Daisuki 100 Manten is the B-side track which is sung by Fukumura Mizuki and Ishida Ayumi, a rather unlikely pair in my opinion, but a pair that also works pretty well. As you can probably guess, I pretty much love this song (a lot more than Love Innovation) and listen to it quite a lot. It's incredibly cute and catchy, and the blend of these two surprising voices is pretty good. I think that together, these two girls work very well, and that's probably because we have the fresh, calming, pure and refined vocals from Fukumura blended with the rough and raw vocals of Ayumi, who sounds a lot softer than she did before when she yelled through her microphone in an attempt to sing. Again, it's surprising how good they sound together, but the sound they produce is beautiful and it's undeniable that they work well together despite how raw Ayumi sounds. The song is really cute, and whilst generic, very fun to listen to. It's great to hear Mizuki lead a song so strongly with another person (because Suki da na Kimi Ga was all duets, simply not satisfying enough) and to hear Ayumi lead something for once. She still needs work, yes, but you can truly hear her improvement in this song and how hard she is working. She has good vocal strength, and I personally find that something to look forward to in the future when she's developed more and become a better singer. They both sound good, with Mizuki a bit better because she's had more time to refine her vocal skill, but together they sound so damn good, and you can't deny it. It's generic, but it works for both these girls without being too cutesy that you can't hear how good they are naturally. 5. Shinnen Dake wa Tsuranukitoose! I'm not going to deny it at all; this is the song that I have the least interest in, even though I do like it, but I really can;t be bothered to care for it enough like I do the others. It's fun and catchy, but it isn't as interesting as futsuu no Shoujo A or as good as Love Innovation, or even as cute and sweet as Daisuki 100 Manten. The good thing about this song though has to be that it shows off the rawness of Morning Musume's two worst singers at the moment, but there's also a downfall as well; this song ultimately shafts the one decent singer in this group, and that honestly pisses me off. This group brings together the worst singers in Morning Musume, sans Zukki, and whilst that does please me, it does annoy me that even Riho, who gets a lead in almost everything, is given more than Zukki who actually gets barely anything in this song. Her three (small) solo lines in this are pitiful in comparison to the two long lines that Riho and Sayumi get, and yes, I do have a problem with it, mostly because in Love Innovation she got no solo lines, the same as Fukumura and Kudo, and yet she is still shafted even in a sub-group. Then again, it seems that this song is there to highlight the worst of the vocals in Morning Musume right now, which I don't mind because Ikuta and Iikubo actually lead the song, but I still have a problem with it because the best singer of the five is pretty much given nothing. That and Riho sounds worse here than she does in Wakuteka. My other problem with the song in general is the sound; out of all the songs given, this is the least original. Shinnen Dake wa is basically a mash up of Takara no Hako (the slow beginning), Dokka'n Capriccio/Produce and Yamette yo! Sindbad. I really find no originality in this song whatsoever, and even if it's really fun to listen to, I can't help but think of those three songs when I listen to this song. I've thought about these three songs (mostly Dokka'n) ever since I first heard this song, and I won't stop thinking of them any time soon, either. It's a fun song, don't get me wrong, but the fact that Zukki gets shafted, even in duo lines, and the familiar sounds of past songs really turn me off the song itself. That, and it issues the worst vocals without giving a decent balance of someone who can sing with good pitch. Again it's good, but I prefer the other songs. Hence why this song is deemed as one of the worst on this single, and it is my least favourite despite the fact that yes, I do enjoy it a lot when I listen to it. But it can't beat the other songs on this single, no matter the fact that my Top 3 Morning Musume members are in it. Can't deny that Eripon is getting better, though! And that is basically my opinion on all the songs. I do like this single, actually I like it a lot. It has a very diverse amount of sounds to it and it gives us a great example of nearly (NEARLY) everyone's vocals other than Suzuki Kanon's. I think that as an A-side, Wakuteka is one of the best from 2012, and it actually doesn't accentuate Riho's pitch problems like Shinnen Dake wa does. The B-sides are also pretty damn good, especially Love Innovation and Futsuu no Shoujo A, which brought new sounds that surprised me but allowed me to appreciate people's vocals. This is a good single as I have said, and it's truly a winner for me from Morning Musume. If only Riho hadn't sang anything too long in Shinnen Dake wa, though. Then again, it sounds too familiar for me and I generally don't care about it, which is a shame because again, my Top Three are in there. Meh, whatever. This single still sounds better than One Two Three. Nice review! I absolutely loved Futsuu no Shoujo A! It's an absolutely amazing song, so crazy good! I adore it!! !